The Holy Mountain blu-ray is one of those holy grail blu-rays. I waited for many years of a decent home video version of this film – from the bootleg dvd to the Italian PAL dvd to the excellent remastered NTSC DVD and now I can finally be satisfied with the blu-ray of the Holy Mountain. I thought that the remastered DVD was amazing, but wait till you see the blu-ray. If you have seen the remastered DVD, you should be pretty impressed with this blu-ray. The video quality is a huge upgrade, HUGE! Everything from close-ups to long shots are all crisp and clear and shining with detail. There’s a scene where the thief first tries to attack the Alchemist where you see the majority of the Alchemist’s hat covering the top of his face. On the DVD, I thought it was totally covering his eyes, but on the blu-ray you can see his eyes peaking out..staring at the thief as he takes the slow cat steps. The blu-ray is slightly grainy, but it’s good grain. This is a film from 1973 and it’s a film that has been through tough times. Don’t expect The Sound of Music, but if you have seen the previous home video versions of this film, the blu-ray video quality is phenomenal! This is a totally colorful film as well – all the colors finally pop out with life on this blu-ray. The blu-ray video quality really stands out once the team heads out to the mountain. All those outdoorsy nature shots look amazing. The only negative that I noticed with the video quality is if the camera pans to the left or right to quickly, then you get that wierd flickering effect. But this only happens once or twice in those big crowd scenes at the beginning. The DTS-HD 5.1 really sounds great – the sounds and the music fill up your room…and there’s a great use of bass that’s used to enhance the experience a lot more than how it sounded on the remastered DVD. For a 1970s film, this audio option is pretty damn impressive. And the audio comes across very natural too. The extras are the same as on the remastered DVD. The coolest extra is how they showed the restoration from the Italian DVD (or was it the Jodorowsky-supported bootleg DVD?) to the remastered USA DVD. But the best and most important extra is the audio commentary. 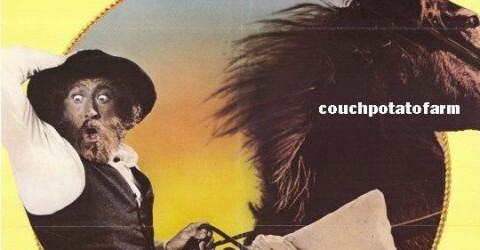 This is no ordinary audio commentary. If you can figure out this movie without listening to the commentary, you are a genius, but I find it necessary and even improves upon the movie by listening to the director’s commentary. He’s a genius and an artist. He explains all the scenes and its symbolism. Jodorowsky isn’t just some obnoxious pretentious director – he has a reason for creating every scene in the film, and he explains it simply and clearly. This is one of those films that should be played in schools. 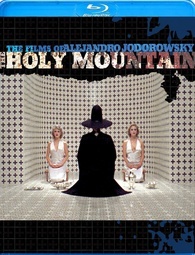 The Holy Mountain is a masterpiece – no other obscure/underground/wierd film even comes close to the epic scope of this film. The blu-ray is now in my top five blu-rays that I own. Anchor Bay did a spectacular job of remastering this movie onto blu-ray. So far, this is the best blu-ray of 2011!